As you may know, we are taking steps to live a healthier lifestyle as a family. We are living simply, trying to slow down, and ‘make our own’ whenever we can. The big trick? I need it to be easy. So much of the “making our own” is hard! But THIS my friends – this is easy. These calming lavender lotion bars are quick (quick!) to make and so super easy. Plus they are amazing. Soothing, not greasy, and just the right consistency. 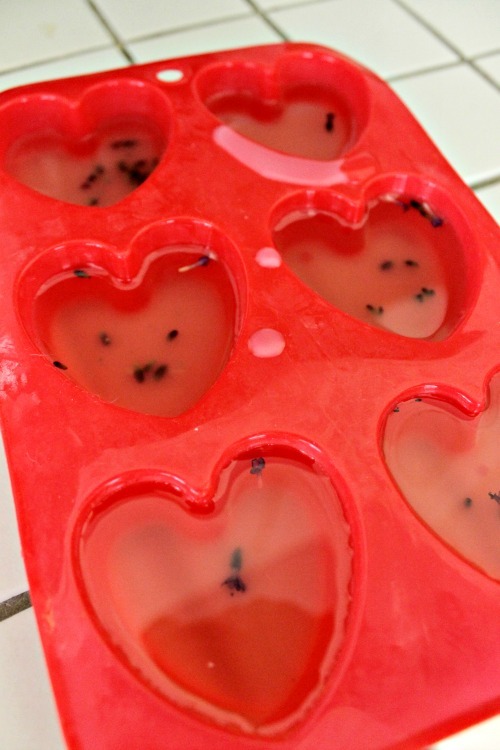 Just the way DIY lotion bars should be. We make lotion bars by combining coconut oil and beeswax. Plain and simple. To get a harder lotion bar we use equal parts of beeswax and coconut oil. But lately I have been playing around with the consistency of our bars, and what little additions we pop into them. Madeline and I have come up with such a lovely, relaxing, and simple lotion bar – so I thought we would share. 3/4 cup Beeswax grated or chopped there are also super convenient natural beeswax pellets that we order from Amazon. we also add a little bit of Vitamin E, but again this is not necessary. 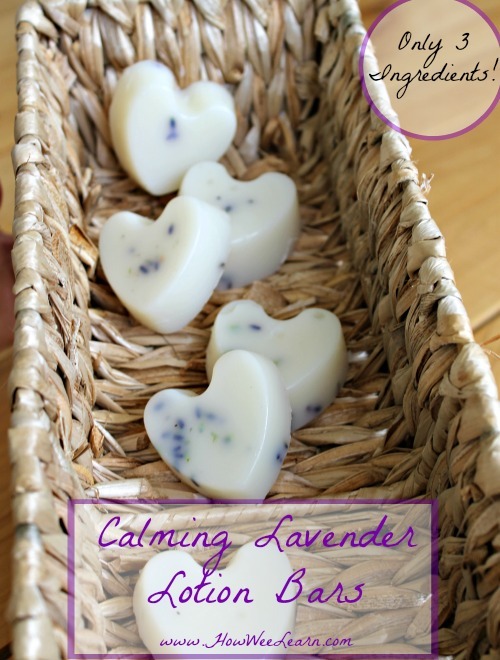 To create these calming lavender lotion bars begin by growing some lavender in your garden (I’m kidding, of course, but my goodness I wish I had done this sooner!! We planted lavender this year and it is so simple to grow, and lovely to be able to use on a whim!) Or you can buy dried lavender most anywhere, or online if you should have trouble finding it. You can also buy it at most gardening stores for either outdoor planting, or as an herb to go in a kitchen. Anyways, back to the lotion bars! 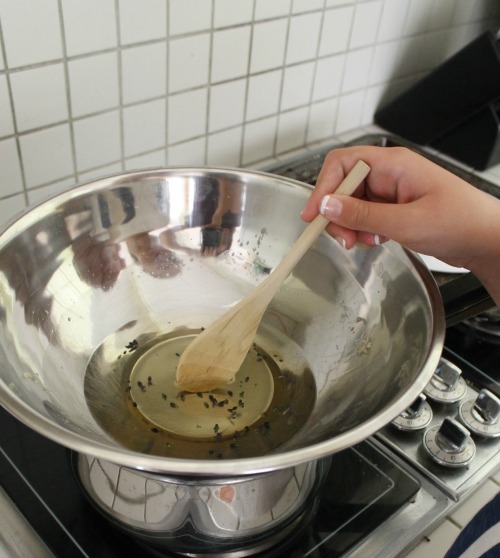 Simply grate beeswax to fill 3/4 cup and melt in a bowl over a pot of boiling water. It will melt in no time! Once it has melted, remove the bowl from the heat and still in the coconut oil. And you can end there if you so choose – otherwise stir in your lavender and vitamin E. Pour into a small loaf pan, or silicone molds and let set for about an hour. You can place them in the fridge to speed the hardening of these bars. We actually keep these lotion bars in the fridge in the summer – because they are prone to melting in a hot farm house, and because they feel so nice to apply cool on hot summer skin! I put this on my little ones after their baths, and use it myself every day. I love taking small, simple, manageable steps to help my family live a healthy lifestyle. Making our own cream and lotions is so very simple, and keeps us all away from the many unknown ingredients in most lotions. Thank you so much for reading friends! And remember, if you want to LOVE time with your kids even more – I’VE GOT A BOOK FOR THAT! Does it have to be coconut oil? What would happen if I substituted olive oil, or half and half? Hi Dina! Coconut oil is a solid at room temperature, which helps this lotion bar stay a bar. You could certainly make lotion with olive oil, or half and half, it would just be a softer bar and you may have to play around with the measurements a bit. Thanks for reading! This made 6 good size (fairly large) bars of lotion. Thanks for reading! Can soy wax be used instead of bees wax? I am afraid I am not sure Lisa. I am not familiar with soy wax, but if it has the same consistency as beeswax, then it should work just fine. If you give it a try, please come back to let me know if it worked well! Thank you. I am so glad you made it and loved it Mariam, Thank you for taking the time to let me know. I cannot wait till I can have a go at making these bars I am trying to do a home made Christmas this year ,bath and skin care are top of the list can you suggest some masculine oils that will be safe to use please? Your website is wonderful keep up the good work. Hi Micki, thank you for your kind words! I love your idea for a homemade Christmas. I strive for this every year and have so far always fell horribly short of one! I am afraid I am not sure of an oil to recommend … I only use about 5 myself as I am unsure of the safety of most and don’t want to much about with things I am not confident in. None of the ones I use are overly masculine. Sorry I cannot help you out – but I really admire you starting this early for your Christmas dreams – way to go! Patchouli oil is masculine and used by a lot of dancers on their skin. Hi- for a masculine smelling lotion bar, simply add a few drops of an essential oil instead of lavender. 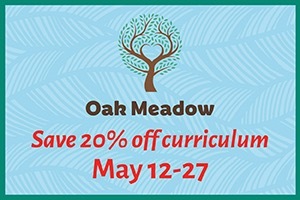 Eucalyptus, clary sage, and tea tree oils are a few that might fit the bill. Most places that sell oils have testers to sniff- I’m sure you’ll find several you like. They are VERY concentrated, so begin by adding just 2 or 3 drops to your mixture & see what you think. You can always add another drop, but it’s really hard to remove a drop if you use too much hahaha! Essential oils also have healing & anti-microbal properties, so you may even want to do this in your regular lotion bar recipe. THANK YOU for such an easy recipe! I can’t wait to try it out!!! Can essential oils be substituted for the lavender? I like the suggestion for Christmas presents, my daughter loves anything peppermint, so I wasn’t sure if it would be ok to use a few drops of oils instead. Do you think it would change the consistency of the bars too much? Yes, you could definitely add in essential oils. We have done this a few times and the consistency is pretty much identical. I add in about 5 drops with the amount listed in this post. Thanks for reading Amanda! I’m thinking of having my son make these for Christmas. Do you know how much beeswax is in 3/4cup? I’m looking on Amazon and wondering how much to purchase. Thank you! ? Hi Becka! So happy you are thinking of giving these a try, we really love them. I am not sure how it is listed on Amazon – is it in grams? I have a one pound block and could get about 12 or so cups from it. I am not sure if that is helpful or confusing? Hi – when you say that you add some Vitamin E, in what form are you adding it? Is it the capsules? Hi Linda, great question. I use the liquid form of Vitamin E, but you could use the capsules as well. Just open them up and pour out the vitamin E. Hope you love them! I found that the beeswax was very hard. I used a cheese grater but I am wondering if anyone has a better idea? The grater worked, it was just hard and I grated my fingers quite a few times! Ouch!! I only use a grater – but your right, it’s not the easiest. Hopefully someone has a great suggestion! Put your beeswax in the freezer…it is much easier to break apart in a frozen state. Will be giving this one a try – thanks for the tip! Can’t wait to try this! FYI, I bought beeswax beads from planttherapy.com that are easier to measure out and melt. I actually use beeswax pellets for recipes like this to avoid the hassle of grating. I believe I got an organic pound on Amazon. 🙂 I’ll be making these as teacher gifts for Christmas. Thanks for the simple recipe! Thank you for your great website. I am thinking ahead for Mothers’ Day (actually growing and drying the lavender). Would it be possible to swap coconut oil with mango butter or shea butter? Thanks! I have no idea I’m afraid – does anyone have an answer for Andrea? We use raw Shea butter in our lotion bars and sticks. We use Skin So Soft, by Avon as a scent and I can tell you there is NO rancid smell of the butter, even before adding the scent. She’s butter is excellent to use. Just add another 3-4 tbsp. Of beeswax. Great – thank you for letting us know Lee. I am super interested in making these for a craft show I’ll be participating in shortly. I was wondering though, could I use lavender essential oils instead of actual lavender? Hello. My daughter was going to make these for her grandmas birthday. Are lotion bars used in the shower? Hi Cheryl, what a sweet idea! These bars are lotion that can be used after a shower or anytime of day. I use mine before bed. I hope you and your daughter have fun and I know her Grandma will love them! I have soy flakes and will try instead of beeswax 🙂 how long does these lotion bars last? Thanks for sharing!! Oh, please let me know how they turn out – I have had a few emails asking about using soy instead of beeswax. Our lotion bars last forever … that is to say we use them well before any have gone bad, so I am afraid I’m not sure. Definitely months though! Good luck with your soy lotion bars, I’m eager to hear the results! Hi Amy, I am so happy you would like to make them – they are so fabulous. 3/4 cups of beeswax pellets is roughly equivalent to 6 ounces or 170 grams I do believe. Have fun! Hi, you can buy a set of measuring cups at a dollar store. Probably easier than weighing the ingredients. We made the bars with beeswax pellets, vitamin E oil, and lavender. I am wondering how you use the bars? They are hard and rubbing them on your arm leaves a bit of scent but not much more. I like to warm the bars up a bit by rubbing them in my hands first. Then I apply the lotion with my hands. They are very gently scented, but to get more of a scented simply adjust the amount of Lavender used. And you are most welcome!! 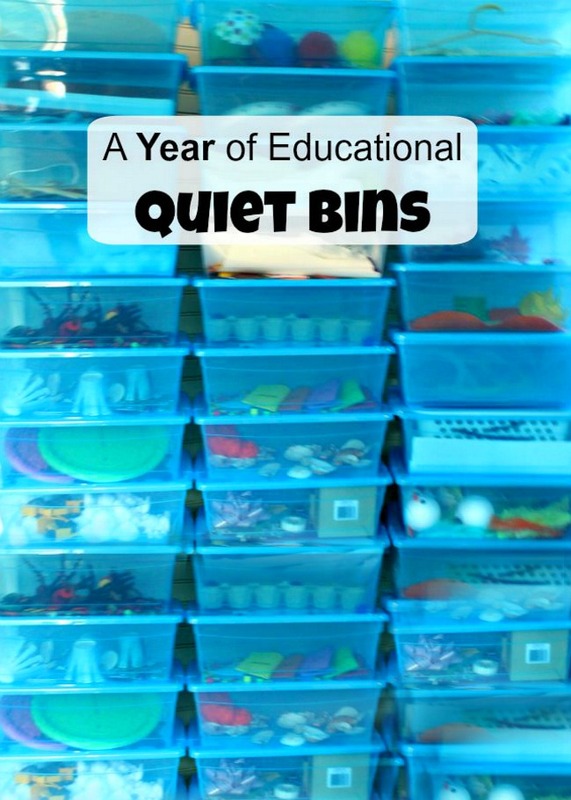 How do you like to store/dispay these when they are being used daily? 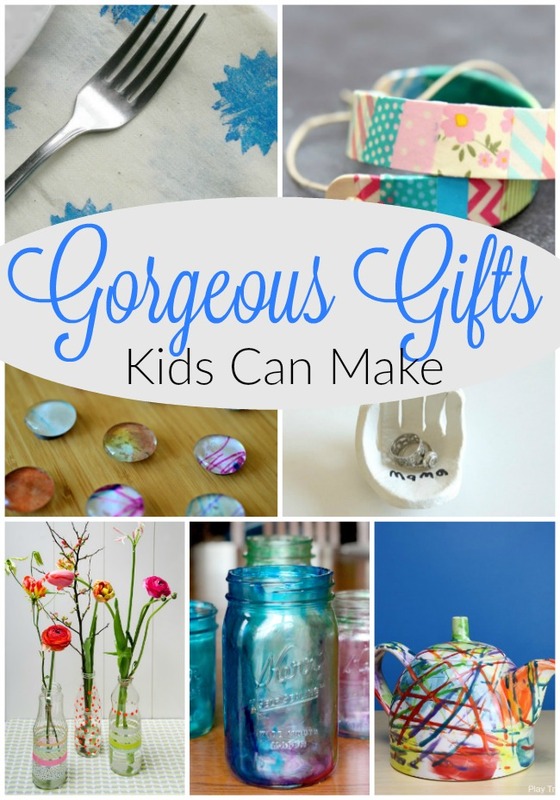 I’m thinking about having my kids make some as gifts and am wondering if a tin or ceramic dish would work well. Hi Judy. Great question! I keep one on my dresser in a little dish – so a ceramic dish would work very nicely. I often gift them in small mason jars, decorated to look lovely. Have fun! 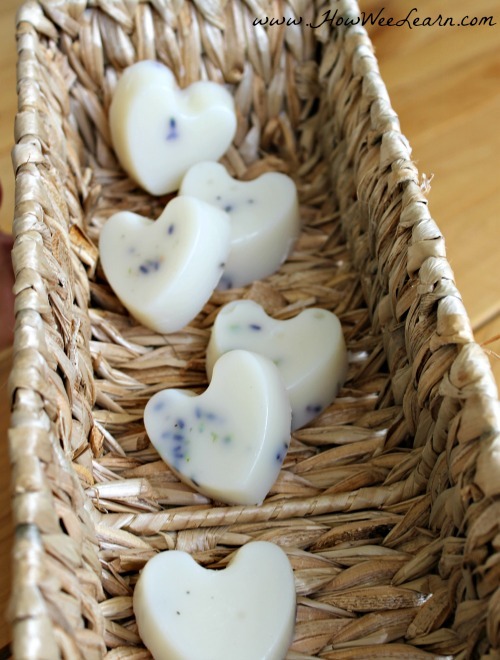 I have made these lotion bars in lavender and rose and they are absolutely wonderful. I made little ones for samples and huge ones as well. Oh I bet rose is divine! I am going to need to give that one a try. Thank you for the idea Vickie – so happy you like this recipe.